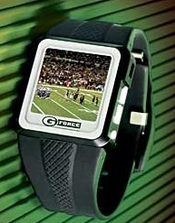 The Home Theater USB Watch is designed to give you the experience of a home theater with the functionality of a watch. This means that you can tell time and watch your favorite movie right from your very own wrist with the 2GB of built-in storage. The Home Theater Watch plays MP1, MP2, or MP3 and WMA audio files, allows you to view JPEG images, and it has a digital voice recorder with mic and USB flash drive. The screen is a stunningly LARGE 1.5 inches and features a brilliant 260K color display capability. Your videos and images will look just like they do on your PC.